Track cycling is one of the most exciting sports in the world, but for a newcomer to the sport or even an experienced spectator, the event schedule can be a bit of a mystery. I suspect many of you watched the Olympic track events in awe and would jump at the opportunity to get involved in this spectacular sport. However with all this excitement and enthusiasm, you are thinking where do I start? And what type of equipment do you need? So with a little bit of effort it can be a really easy sport for you to start competing in. Just get your head down. Here are the basics on what you need to know. 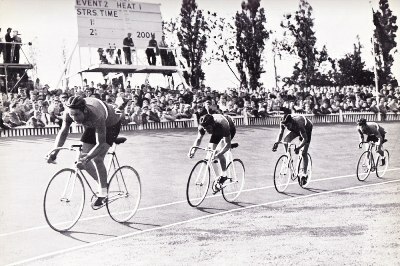 Herne Hill velodrome in London as a long history of competition. Click image to find out more. The length of the track has varied since the early days but nowadays all events take place on a one-lap track of 250m. Today’s race formats vary from individual races against the clock to group events that end in breathtaking sprints off the final bend. This creates an electrifying atmosphere in the stadium – something you will never forget – as riders speed around a steeply banked track (42 degrees) and the spectators are brought very close to the fast & furious action. 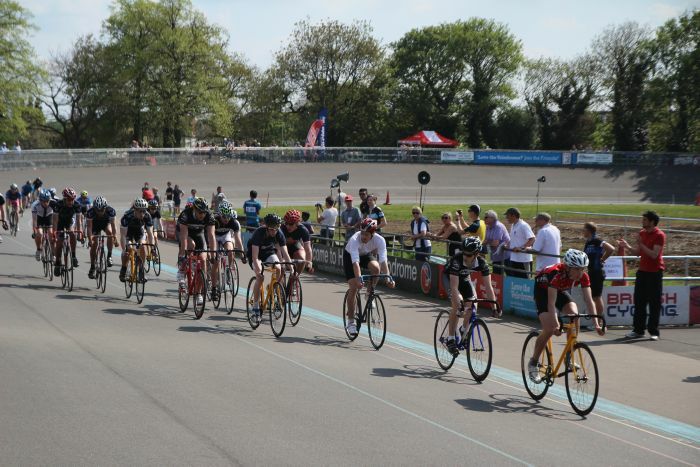 Track racing is one of the purest and fastest forms of cycle sport, and I would encourage all of you to go see an event at least one – you won’t be disappointed. A head-to-head contest between two riders over three laps of the track. Competition begins with a timed 200 metre run which decides the seeding for the knockout rounds. Racing is highly tactical yet explosive – incredibly quick, with riders reaching up to 77kph. You probably saw the weirdly slow ‘cat and mouse’ tactical battles (complete with reflective visors over the eyes) followed by all-out drag races for the line. 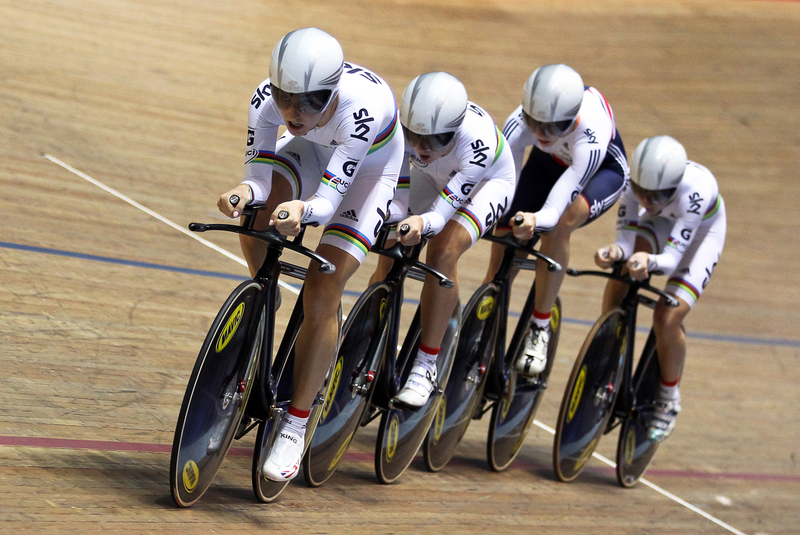 A standing start all-out effort, the team sprint involves three riders over three laps for the men and two riders over two laps for the women.The current men’s world record time is 42.600 seconds (that’s almost 40miles average with a standing start!). 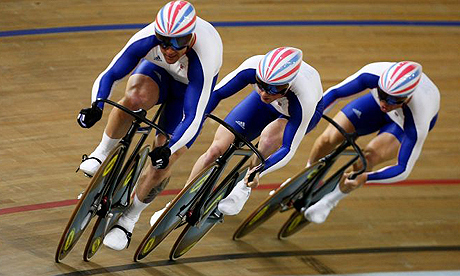 This was set by the British team of Philip Hindes, Chris Hoy, and Jason Kenny in the Gold Medal Final of the Team Sprint event at the 2012 Olympic Games. The women’s record of 32.422 seconds was set by the Chinese pair of Guo Shuang and Gong Jinjie, also at the 2012 Games. At the end of each lap the front rider leaves the track until only one remains. Races are short and thrilling, with titles decided by thousandths of a second. A pure standing start effort against the clock, the time trial is 500 metres for the women and a kilometre for the men. This is the event that Wiggins became junior national champion in, back in 1997, and started his raise towards winning the Tour de France in 2012. It is known as one of the most punishing of the track disciplines, often favouring sprint athletes towards the ‘endurance’ end of the spectrum. This is one for the endurance athletes. A head-to-head race the event sees riders begin from a standing start in pairs on opposite sides of the track (remember the split screen on TV? ), who literally “pursue” each other for 4000 metres (3000 metres for women). After qualifying, the four fastest teams compete for the medals, the fastest two vying for gold and silver, while the third and fourth fastest qualifiers battle for bronze. In the finals, if a rider catches their opponent, the gun is fired and the race is over. Otherwise, the first rider across the line wins. This event is similar to the individual pursuit but consists of four riders, riding only a few centimetres apart (no mistakes!). Both men and women compete over 4000 metres. 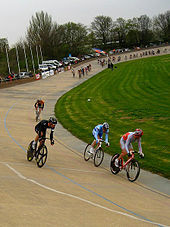 The points race is a mass start event (a pack of riders) over a set distance, usually 120-160 laps, with points available at ‘intermediate sprints’ – held every 10 laps. 5, 3, 2, and 1 points are awarded to the top four finishers in each sprint. The winner of the race is the one to have the most points at the end of the race. In addition to the sprints, any riders managing to lap the main field is awarded an extra 20 points. This is therefore a popular way of gaining the points required to win the race and leads to many such attempts to gain a lap during the race. The reality of the points race is it is one of the most physically and mentally demanding of the track disciplines, with speed, stamina, technical skill and tactical awareness all required in large amounts. The Madison (guess where it got it’s name) is a ‘relay’ event for teams of two riders who take turns racing over a set distance. Like the points race, there are points available for intermediate sprints and lap gains. The omnium is a multi-event discipline akin to the heptathlon in athletics. An event for the all rounder with a mix of sprint, endurance, individual and bunch events, the omnium rewards consistency across two days of competition. Points are scored according to finishing position, with the rider with the lowest total crowned the winner. Laura Trott won Gold in this for Great Britain in the Olympics. 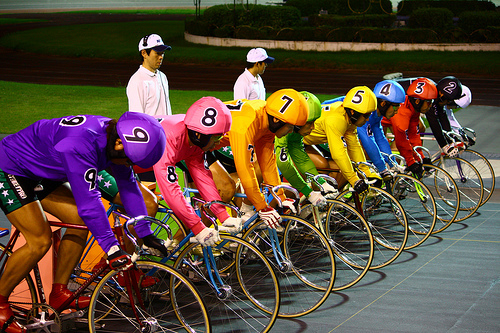 Now you know the basics of what events are included in track cycling, how do you get started? 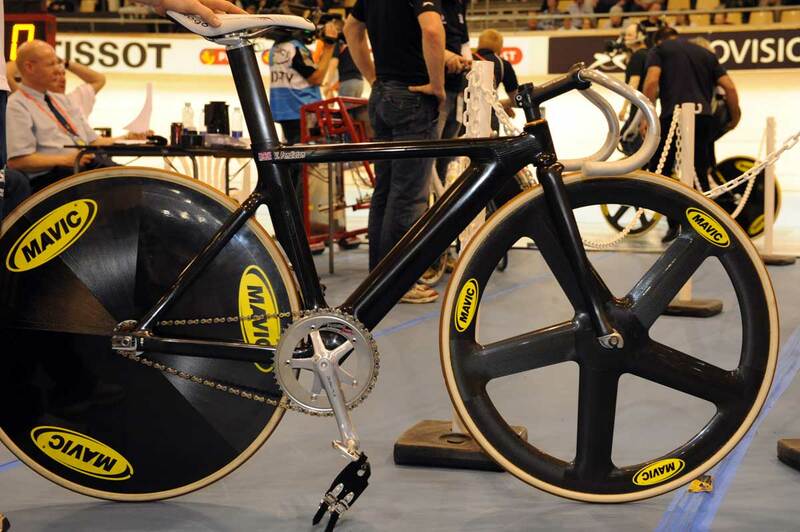 Track bikes are extremely light – often weighing as little as 7kg – and narrow, and lack brakes. The rider controls the bike on a ‘fixed’ wheel system, which means that rather than freewheeling, the rider controls the speed of the cycle with pressure on the pedals. Bike handling skills are essential with all this hair-raising riding in a pack (Chris Hoy started his career in mountain biking for example). The bikes also have no gears, which means you start in a very high top gear, which makes a standard start quite difficult. As it’s a specialist sport, beginners may not have all the equipment to start off with but if you go down to British Cycling taster sessions at a number of venues around the country, there will be proper track bikes to hire and dedicated coaching. Track cycling is a great social sport, with lots of teammates! 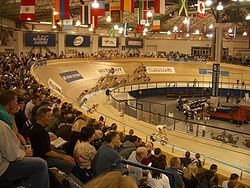 You will love the sport of track cycling. It is suitable for a wide range of riders – sprint events for those muscular cyclists, capable of producing massive power for short distance, and endurance events for lighter riders, more suited for high speeds over long distances. So don’t hesitate to give it a go. British Cycling provides wonderful support and if you need any help with further details just drop them a line. The author – Nick Longworth – is a Cycling Development Officer for New Zealand National Velodrome. Please don’t hesitate to leave a comment if you have any questions. 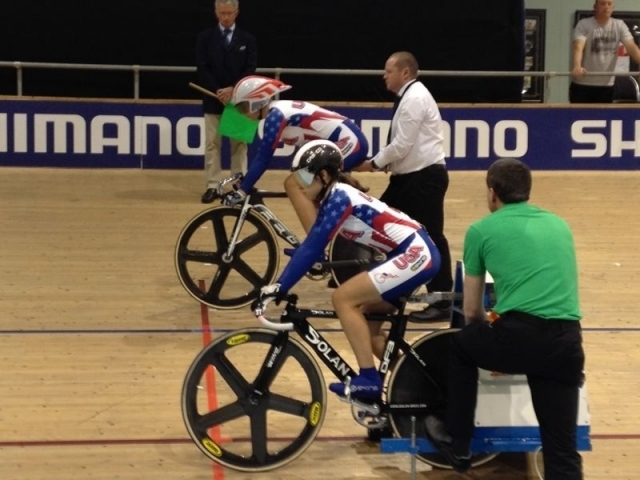 Track Cycling is the perfect foundation to all cycling. We have “give track a go” here in Perth for schools and for anyone who wants to give it a go. So it is great seeing this post!